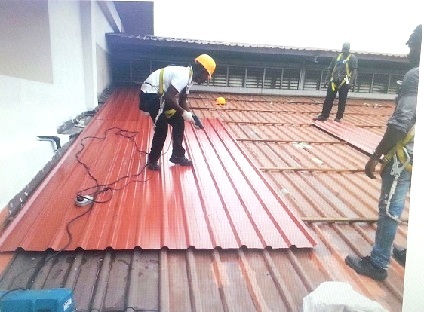 We are one of the best Roofing Contractors in Singapore, provides many kind of roof repairing works for both commercial & residential clients. We ensure that our client’s satisfactions with what they expected on our work. Call us now for FREE..! estimation for you. ATLAS Roof Repairing Contractors provides free inspection on your place with free cost estimation on repairs for roofing, roof-related sheet metal, masonry, caulking, sealants and waterproofing. Within 48 hours the customer will receive a written detailed report of the problem, the cause if known and the recommended repair with photos. The recommended repair includes the materials to be used and the repair method. Time & Material repairs are the simplest business transaction with a service department. In order to maintain a high level of transparency all materials and labour with costs can be detailed in T&M invoices. In addition there is a clear description of the deficiency found, likely cause and repair that was undertaken. Finally, before and after photos of each repair are provided to the client. Time & Material repairs with a pre-set limit by the customer are common with clients who do not want to wait for estimates and need fast action but have a ceiling on what can be authorized. Usually customers stipulate that if the repair exceeds the Not-To-Exceed amount the Service Technician can call the customer dispatch and get further authorization.